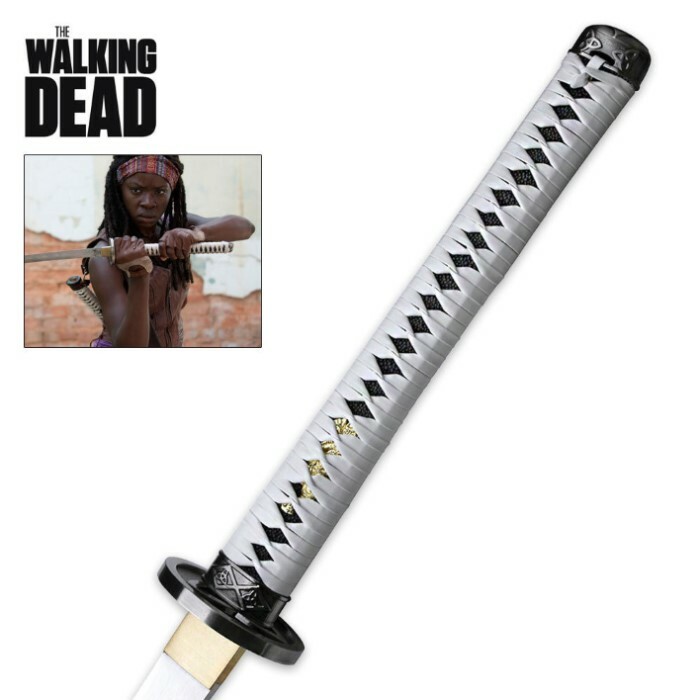 This newly released officially licensed Sword of Michonne from the popular television drama The Walking Dead is a must-have for every true sword collector and avid fan of the show. Crafted to the exact same specifications as the real-life filming prop, Michonne's sword features a hand-forged 1045 carbon steel blade that is 27" in overall length. A custom cast tsuba and a host of authentic details complete the ray skin and cord-wrapped handle in dramatic "Walking Dead" fashion. This officially licensed collectible comes to you with a Certificate of Authenticity and a matching scabbard complete with a shoulder harness, just like the one that Michonne carries in the series. This sword is the real deal at 42" in overall length. Better quality than I expected, solid and sturdy. This is a dressed up piece of steal that isn't sharpened, I expected more from "True Swords." At least more specific language stating what you will receive. Luckily this was not the first thing that I had bought or they would have lost a customer from the start. 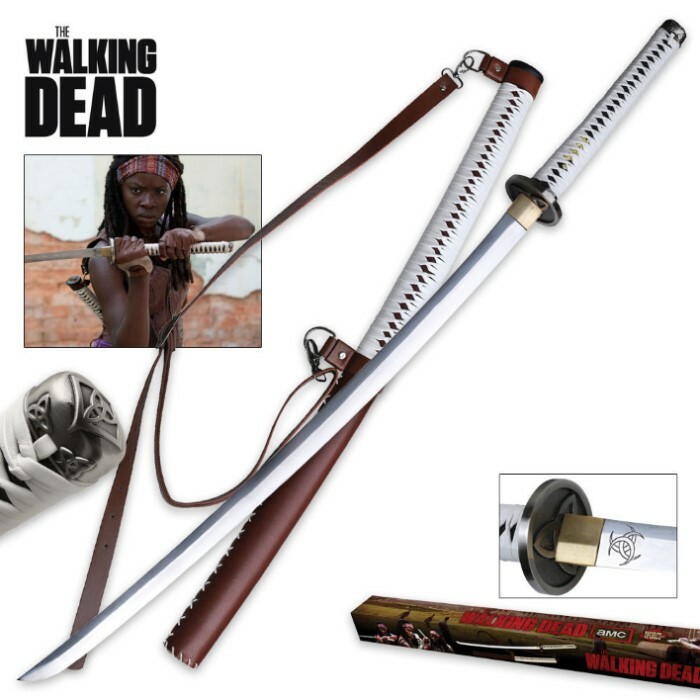 I love the series "The walking Dead" But this is a $35-50 Musha Katana with an etching on the blade and a shoulder strap. Good sword but only a memorabilia piece. Might be worth the $214 price tag at an auction years from now to someone with money to throw away on art. Buy it if your a speculator. 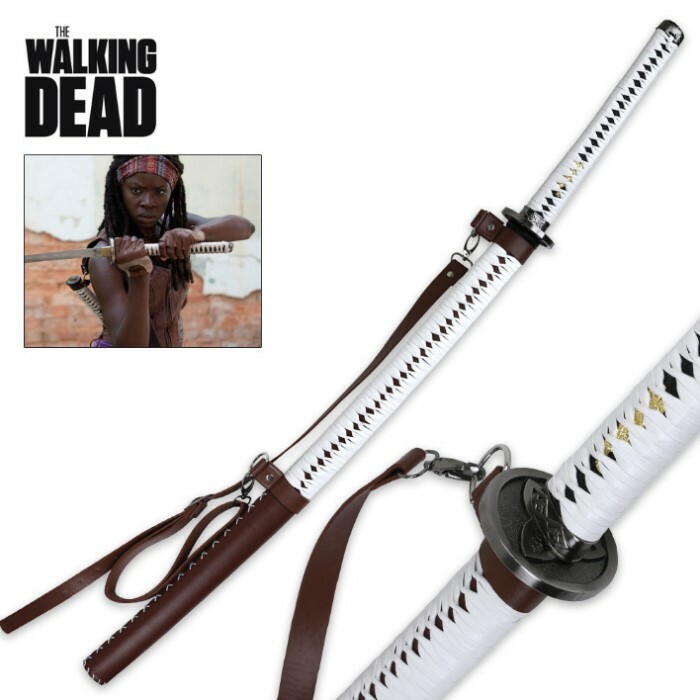 These licensed michonne katanas are beautiful replicas of the sword in the show. The grip is slightly different than the sword in the show but most people don't even notice. Many other details are exactly like the sword in the show right down to the tiny white string sticking out at the end of the scabbard. Very nice replican and I find most people are absolutely trilled with this sword.. With that being said..THEY ARE WALL HANGERS ONLY.. UNSHARPENED. Do NOT buy this sword if you are thinking of slicing zombies with it. That's just silly. It's a collectable!. THANKS BUDK!!! Seems like a great price due to the fact at other places like Amazon they are being sold at almost twice the price. ($390 to $400) It looks to be the same sword. Michone's sword from the hit AMC series "The Walking Dead" is a well constructed, beautiful piece that is accurate in every detail. Though it is not edged, it is constructed the same as any battle worthy katana, and is the centerpiece of the katana display in my store. It amazes many customers when I compare the construction of this sword to several high end swords and they can see that it actually has comparable, and in some cases better, specs. The attention to detail on the wrapping could better, and the shoulder strap a bit wider, but these are minor details. You must also, if you are a dealer, take care when displaying the sword and showing it to customers, to insure that the white lacing stays white. BUDK's pricing is extremely good, lower than I've been able to find at any other supplier that carries this item, and I have been able to sell them at a very reasonable profit, having sold three in less than a month.